Is Sophie Monk hiding a 'secret boyfriend'? BACHELORETTE Sophie Monk has a 'secret boyfriend' who she attempted to get on to Ten's dating reality show as an intruder, it has been claimed. On 100's Chrissie, Sam and Browny radio show yesterday, host Jonathan Brown made the sensational claim that Monk, 38, is in a secret relationship with a man in Melbourne. "We've been out digging. We did hear from very good authority that Sophie Monk has a boyfriend and it's not Stu Laundy," he alleged. Brown said the Melbourne-based mystery man worked in the "club scene" - and tabloid magazines were circling, eager to reveal his identity and connection to Monk. "He has been named in gossip pages and [she] did know the fellow before she went into the [Bachelorette] house. It was reported in the gossip pages that she may have made a call to said man and asked him to be an intruder ... That did not happen," he continued. Brown said he had heard about their secret relationship from a "very reliable and very credible source" while golfing. The radio host is the latest in a string of media identities to publicly cast doubt on the validity of Monk and Laundy's relationship since the former Bardot singer picked him in last week's Bachelorette finale. Laundy came out swinging against Meshel Laurie and Kate Langbroek, who he believes "had their knives out" for him during separate media appearances last week. 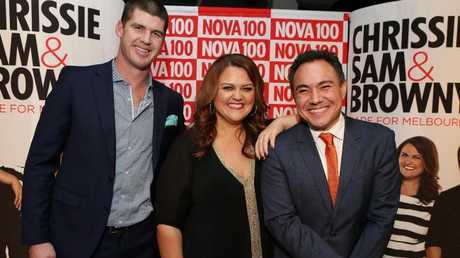 The couple made an awkward appearance on The Project last Friday night during which they were peppered with questions from co-hosts Gorgi Coghlan and Laurie. "I think you've done the classic woman thing where you say that you want one thing but what you actually go for is something else," Laurie said to Monk on the program. "You said in the beginning: I just want a down-to-earth, normal guy who wants to get married and have kids. What you've chosen is a millionaire, who's already married and had a vasectomy." Speaking to Kyle and Jackie O after the interview, Laundy said Laurie seemed "vengeful". "A lady I'd never met just started shooting me, it was pretty rude actually," he said. Laundy also wasn't impressed with the treatment he received from KIIS FM's Kate Langbroek last Friday. He and Monk appeared on Hughesy and Kate, but Laundy claimed things got off to an awkward start before the radio interview had even begun. "I walked into the studio with Kate, Soph and I both saw it, she just went straight at me," he told Kyle and Jackie O. "I wish the public would love us but there's not a lot we can do when these people have the microphone." Sophie Monk and Bachelorette winner Stu Laundy. Picture: Justin Lloyd. Earlier this week, radio host Em Rusciano said she thought Sophie Monk "played everyone" and had no real intention of finding love on The Bachelorette. "I think Sophie Monk has got exactly what she wanted to get out of this show," the radio personality said. "I think she's a smart businesswoman, that she wants to be in the entertainment industry and I think she's become Australia's darling. Everyone got to see her true skill and talent as a human and I think that she's really played a trick on everyone because the ultimate prize for her will be a great career, not a man. "I think she's played everyone and I salute that and I high five Sophie Monk."